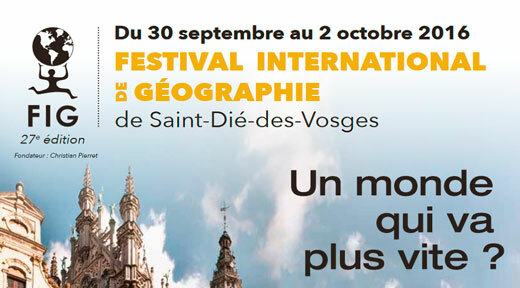 The 27th International Festival of Geography (FIG) will take place in Saint-Dié-Des-Vosges (88) from 30 September to 2 October 2016. The central theme of this year’s festival will be “A world that goes faster?” and the guest country is Belgium. The three-day festival will feature conferences, round-table debates, a comic strip and book fair, geographical cafés, workshops, exhibitions, films and even, this year, a junior FIG festival. As geography and the economy are closely linked, several of the festival events focus on economic themes: innovation in transport and regional economies, acceleration and finance, mobility and migration, development imbalances, urbanity and rurality, digital economy, pace of exploitation of natural resources and sustainable development, “slow” movement, etc. Like each year, the Geospatial Science Fair will showcase new methods and technologies for observing, analysing and representing the territories. For more information, visit the International Festival of Geography website. Also with regard to the Geospatial Science Fair, you can now access the new enhanced version of our data visualisation tool for viewing maps using anamorphosis: “See the world differently”. Published on 6 October 2016. 10000 years of economy - New version!